In general, three classifications of mechanical cleaning devices are available for the dental office. 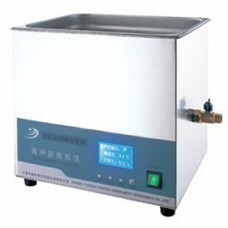 They are the ultrasonic scaler, instrument washer and instrument washer/disinfector. An ultrasonic scaler uses sound waves, that are outside the human hearing range to form oscillating bubbles, a process called cavitation. These bubbles act on debris to remove it from the instruments. Some manufacturers also use intermittent or sweeping sound waves to help improve the device’s cleaning ability and to decrease the potential for hot spots in the ultrasonic bath. Specialized detergent formulations are available for the solutions in ultrasonic machines. When selecting a cleaning agent to use in the ultrasonic scaler, always consider the effect on materials and instruments. Suspend instruments in the ultrasonic bath using a rack or basket fitted to the unit. Do not lay instruments directly on the bottom of the ultra sonic cleaner, as this can interfere with cleaning and cause damage to instruments and the ultrasonic machine. Avoid overloading the ultrasonic device, since that could inhibit its cleaning ability. In general, the timer is activated for three to six minutes for loose instruments and ten to twenty minutes for instrument cassettes, and the timing is adjusted as necessary. While the ultrasonic device is running, the lid or cover should be kept on to reduce the release of aerosol and spatter into the area from the ultrasonic cleaner. Routinely replacing the cleaning solution in the ultrasonic machine is important, and is necessary at least once a day, more often with heavy usage. Instrument washers use high-velocity hot water and a detergent to clean instruments. Widely used for decades in hospitals and large facilities as part of the central sterilization process, these devices have recently become available for the dental office. These devices require personnel to either place instruments in a basket or to use instrument cassettes during the cleaning and drying cycles. Instrument washers for dental offices come in two different designs. One is a counter-top model. This type does not require professional installation. The other type is built-in and resembles a kitchen dishwasher. It functions much the same as the counter-top model, but it has a larger capacity and requires professional installation. Some models have the ability to dry the instruments after washing, some do not.